We are very thankful to the Judges of the SalesTech Awards ceremony for acknowledging and awarding our work...Thank you again Crowd Research Partners. Crowd Research Partners together with the 100,000 member B2B Technology Marketing Community on LinkedIn has announced ConvergeHub as the winner of the 2017 SalesTech Awards. The award is conferred to ConvergeHub in their CRM (smaller than 50 employees) category. In contrast to traditional analyst and research firms, Crowd Research Partners leverage the wisdom of the crowd through the world’s biggest online communities to create fact-based, peer-sourced, and social-optimized content, which delivers market insight and unique benchmarks for today’s professionals - designed to inform and guide technology decisions. SalesTech Awards aims to recognize products and companies that demonstrate excellence, innovation, and leadership in the sales technology space. 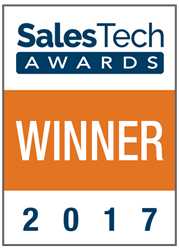 Conferring accolades to companies those who reflect the very best in today's sales technology industry. “Congratulations to ConvergeHub for winning the 2017 SalesTech Award,” said Holger Schulze founder of the 100,000 member B2B Technology Marketing Community on LinkedIn, which organizes the awards program in cooperation with Crowd Research Partners. Prior to this ConvergeHub has also been the proud recipient of the CRM Idol and the Small Biz Influencer Awards twice in a row, since this customer relationship SaaS platform was first introduced to the market in 2014. ConvergeHub’s ability to track and quickly respond to all customer issues and questions helps our customers provide better customer service and create happy customer relationships. Based in Dublin, CA, ConvergeHub is the best small business CRM solution that thrives on providing customers with all the tools, resources, strategies, and systems necessary to promote optimal interactions with prospects. ConvergeHub’s dynamic CRM software helps the business owners to keep track of every action taken to move the prospective customer through the sales process that leads to conversion. With ConvergeHub's sales automation features, businesses are not only able to generate sales actions, but the clean design and intuitive interface of the product also make it incredibly easy to use. ConvergeHub is perfect for small to medium-sized businesses that have the same software needs as large enterprises but do not have the additional budget to spend on multiple standalone software applications and their integration.